Unless this is your first time visiting my blog, you probably know that I like to draw. I'm not great at it, but I'm always trying to improve. One day I'd love to write stories and provide fun little illustrations or side-cartoons for the readers either in the book itself or on a website dedicated to it. So what do I need? Practice! I had some free time today between classes, so I decided I'd try to just draw something with a pen, without going through the penciling process first. I don't honestly think that's a good way to practice drawing, but it's what I felt like doing, so I did. Because I can. 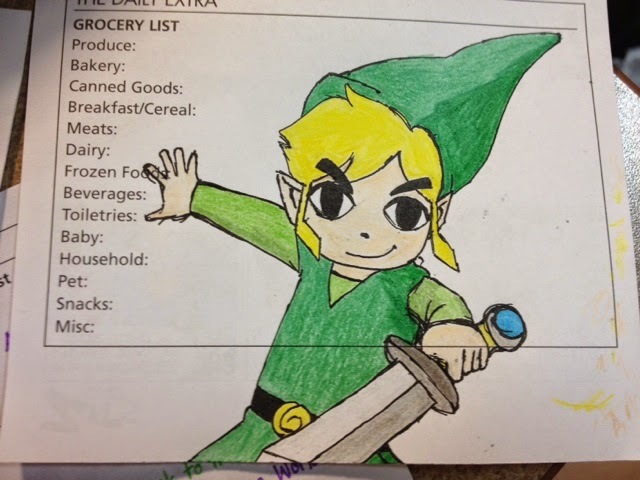 Link seems to be the subject of the week, so I thought I'd try drawing Toon Link, the star of multiple titles in Nintendo's The Legend of Zelda franchise, the most famous of which is probably The Legend of Zelda: Wind Waker (which I've never actually played... unless a ten-minute demo at Target counts). So I looked at that image and tried very hard to draw what I saw, using different parts of the picture to measure and determine where each line had to go. It kind of reminds me of marching band, where we have to make pictures based off of where everyone else is standing. Considering I didn't start with pencil, it didn't turn out too badly. I got a few new ideas on how to draw things and I also have some ideas on what not to do next time. Like, that sword's really messed up. But I have ideas on how to improve, and that's really the point, right? Because I was pretty pleased with how it had turned out and I still had some time before band practice, I decided to color it in. I experimented with some shading. Some of it you can see. Some of it you can't. Like, I actually used two different shades of yellow to do the hair. But you can't tell. I think the coloring process mostly just consisted of me smearing black ink around with my yellow and peach colored pencils and getting mad. 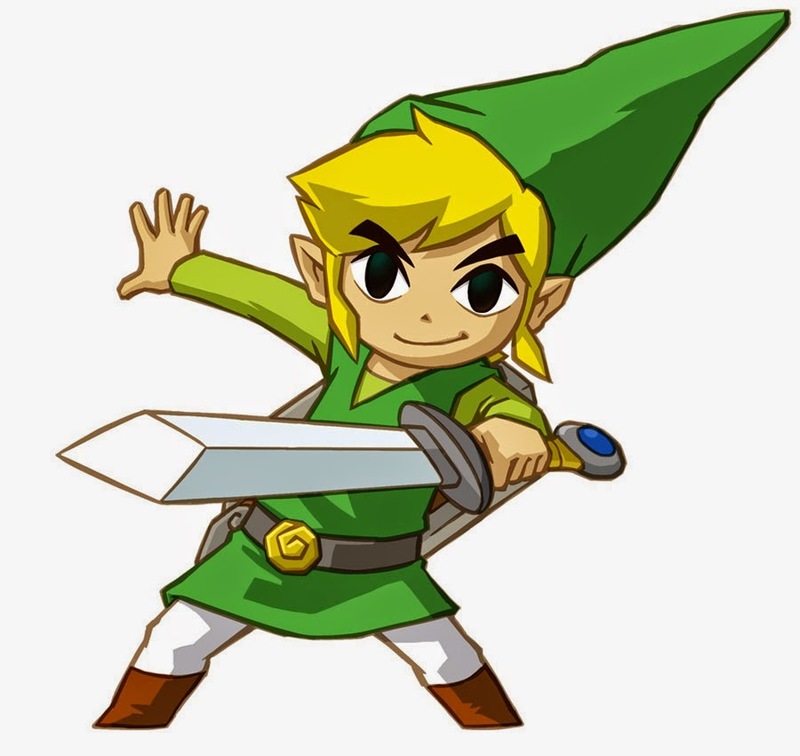 But there's Link, ready to go off on an adventure, defeat Ganondorf, find the Triforce, save Zelda-- all that stuff that heroes do! 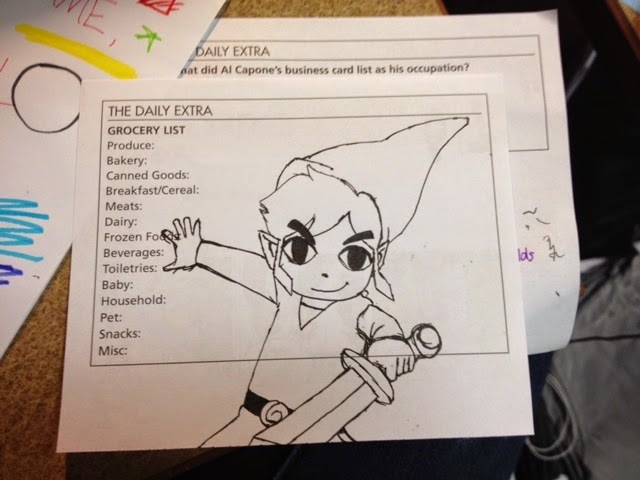 And he kind of looks like he's pushing my grocery list away and telling me to do fun stuff instead. don't say that you are nor great, I like your pics, but I'm happy that you want to improve. I advise you writing service for your further self-improving.